Always remember – less is more. When you are wearing a piece as monumental as a panted jumpsuit, your accessories should complement the outfit, not take away from it. Now I know that many of you consider jumpsuits like this ghetto fabulous, but there IS a way to wear them without looking like a fool. Pick one that is a flattering color (no patterns please), and one nice enough for nighttime wear. I would always recommend pairing a long necklace with it, to elongate your figure. 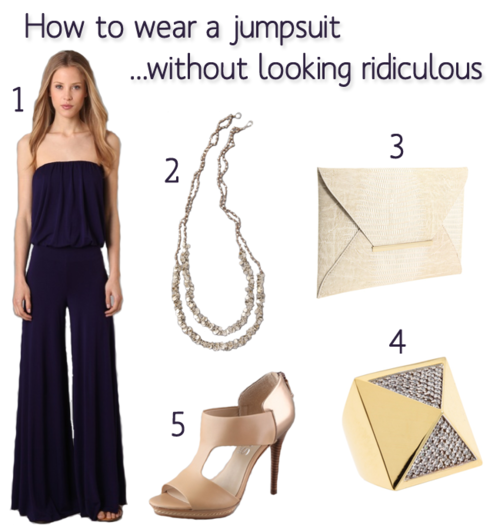 One of our favorite jumpsuits is above by Young Fabulous & Broke.